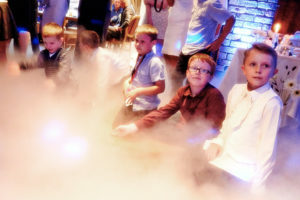 Dry Ice is commonly mistaken for a smoke machine effect. 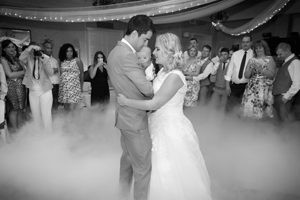 There are multiple differences between smoke & dry ice. 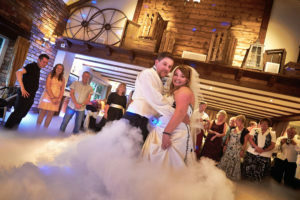 Traditional smoke machines disperse smoke into the atmosphere without any control hindering the ability of your photographer and videographer to capture that special moment. The other issues this causes is the venue can ban them due to setting off fire alarms & guests with chest problems can find smoke machines irritating. 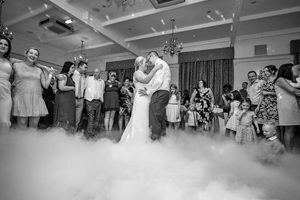 In CONTRAST DRY ICE does not rise above your hip, is odourless & does not effect the fire alarms whilst adding a stunning visual effect for you & your guests to treasure in photos & film. It is also safe around kids & people with breathing difficulties or bad chests. 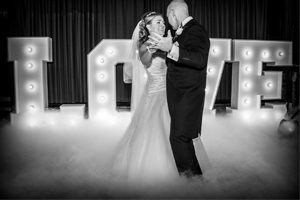 It is also great for people who are worried about the 1st dance & don’t want the attention on their foot work as it hides below the knee so can help the Grooms & Brides relax enough to enjoy the 1st dance. ****TOP TIP**** This is not a common effect & only a handful of professional companies offer this beautiful effect. A lot of hotels have never seen this before & will initially be concerned about the fire alarms. After a chat with us they are more than happy to allow it. The best bit is photographers love it (SEE PICTURES BELOW). Don’t be fooled by other cheaper alternatives that use smoke or haze. 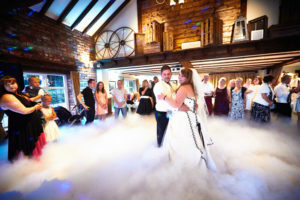 The smoke they use is not dry ice & can cause the venues fire alarms to go off.